Sounds of a Fjord for piano and electronics is a new piece commissioned by Becky Billock specifically for the Mother Earth program. A fjord is a fantastic story of water, with many chapters going back all the way to the ice ages. The fjords were carved by a massive sheet of ice up to three kilometers thick that covered the land. Over time, the glaciers expanded and contracted as water accumulated or melted. These changes created movement that scoured the land beneath the ice mass. As the glacier melted, the mass of ice crushed rock and earth, generating a deep U-shaped valley called a fjord. Living by, and having grown up next to a fjord, I have always had the sea close to heart. The fjord has a vast complexity of sounds, sounds that I like to imagine reflect the creating of the fjord throughout the ages: deep and pulsating, sometimes wild, sometimes calm. Sometimes like a stream where the water meets the land, yet deep and dark the further out you are. Never still, always moving. Reminiscence of waves that have formed far out at sea. Reminiscence of ice melting and land crumbling. The wind travelling in a passage between the mountains on either side, creating a flute-like sound. Notes by Kaja Bjørntvedt. 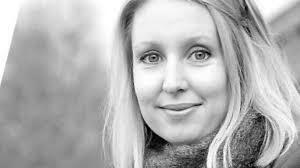 Kaja Bjørntvedt (born 1981) is a Norwegian composer with international engagements. She creates electro-acoustic soundscapes for performances within contemporary dance, theatre, art-installations and films, as well as writing acoustic music for various ensembles. She also loves mixing live instruments with electroacoustic music. In her work, she explores the connection between sounds, movements and visuals, whilst searching for different ways of presenting music to the audience. Her music is published by Musikk-Husets Forlag and Tetractys Publishing, with music included in the Trinity Guildhall Graded Exams Syllabus.